ERP systems create silos of content, along with storage issues and workflow dis-continuity. Oh my! 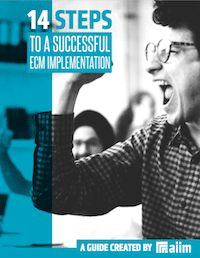 In this infographic, we examine the issues that arise from uncoupled or loosely coupled ECM and ERP systems, the potential benefits of closely coupled systems, and recommendations when considering content integration between core business systems. Enjoy! AIIM recently conducted a survey on Connecting ERP and ECM: Measuring the Business Benefits.